Lectric Cycles has just released a 100mm bottom bracket extended axle BBS02 sold under the e-Rad brand under this link here. The high power 750W nominal drive unit is selling for $1200 which is $99 less than Doug’s 100mm BBS02 drive system over at California Ebike. The e-Rad system comes with a lot of extra goodies for no extra cost like a BCD chain ring adapter ($50 value), a RaceFace Narrow Wide Chainrings ($50 value), and your choice of universal brake sensors ($50 value) or mechanical brake sensor levers and your choice of gear sensor ($100 value), a C965 display and full US-based warranty and service support. You can also get this drive unit in lower power levels than 750 watts for a little less, but why would you ever want to? All e-Rad kits ship with the C965 controller. I really like that the units ship with the BCD adapter and chainring at no extra cost. Competition is always a good thing, especially when it brings down prices. The e-Rad boasts an interesting feature that is not found on any other drive system that I’ve seen. An integrated shift sensor that is installed inline with the shifting cable. It automatically detects when you touch the shifters and immediately cuts out the motor for the duration of the shift ensuring smooth shifts and no broken chains every time. Kepler did this last year by mounting a micro switch on the shifter housing and gutting a Giant Green Button as shown in this thread here on ES. The e-Rad gear sensor solution is far more elegant and functional than anything else I’ve seen. This unit goes inline with the derailleur cable. Easily installed with any shift system. The gear sensor can be purchased separately for $95 here and will work off the standard ebrake Higo connectors of any BBS01/02 unit but the delays will be longer than what is optimal since the brake sensor timing is different from the shift sensor timing. 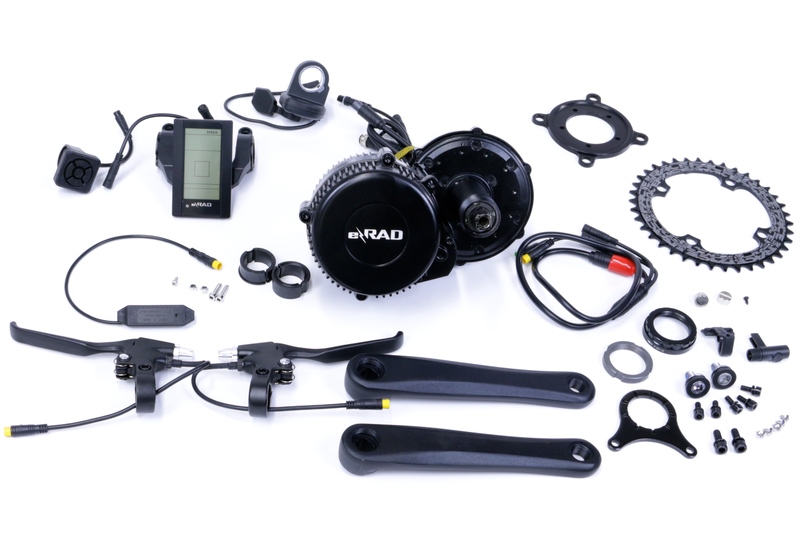 The e-Rad drive unit has a third Higo plug specifically for the gear sensor that connects directly to the controller with custom firmware for optimal shifting/motor timing. Lectric cycles is the sole distributor in North America for this gear sensor and the e-Rad drive unit includes this extra gear sensor Higo connector already installed. Our[drive system] is narrower by 10mm [than Doug’s] to retain a better crank width. Our adapter to widen the spindle shell is alloy as are the spacers and anodized black. We manufacture them here in Phoenix and the up charge for the 100mm is only $150 which covers the cost of manufacturing. We don’t sell the kit as a stand alone item and our kit retains the same warranty as all of our products. We also have tighter tolerances on the spindle to keep it as good or better than factory to protect bearing life. We also have a variety of spacers to better fit a larger variety of bikes. In addition we have shims to fit Giant’s and Trek’s latest models with larger diameter and wider BB shells. Since today is my birthday and no one bought me anything I wanted (my wife is getting me a dump-truck full of manure for my birthday) I just purchased myself two e-Rad drive units (68/73mm & 100mm) for testing. I will test the gear sensor both on the dedicated Higo plug as will as the standard ebrake plug and post my results here in a few weeks. 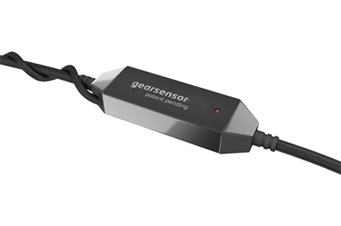 Is The Gearsensor A Total Waste Of Money Or A Must Have? BBSHD First Impressions : Meh. So the claims by other sellers in the Lectric network are not true. This is not a Bafang product, rather another American made conversion. Am I reading this correctly as a kit made in AZ? Yes competition is good, an I’m happy to see the gear sensor. The initial release of which was a nightmarish product. I like mine and have been riding with the original for many months. Several who tried them along with me found a simple brake tap just as effective. I prefer the sensor. One line does throw me and that’s the custom firmware. Where? New code imbedded in the Bafang controller script? Or a bit of malarkey to make it sound smarter? Looking forward to your feedback on the Gearsensor and the new kits. Ride em hard and put em up wet. I’ll post an honest review of the product when I get it. We have to get a fat rim and mount it. We’re going to build a chruiser with chopper forks. Performance should be identical to the Non-fat Mac. Late spring I hope.